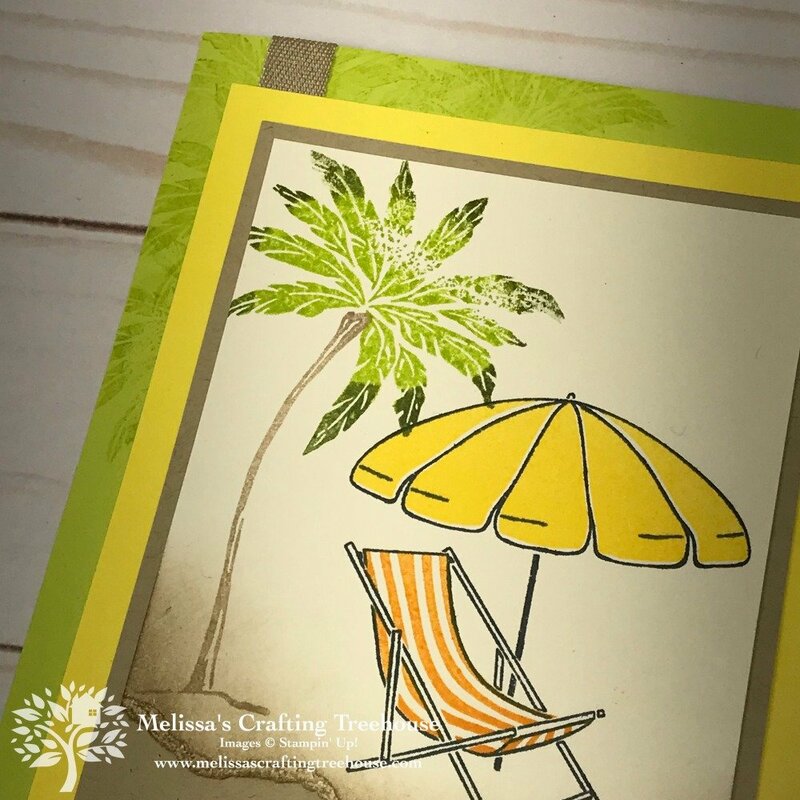 Today’s “Rewind/Redo” project features Beach Happy Stamp Set for a fun, summery design anyone would love! My Redo” project features two step stamping and the rock n’ roll technique. 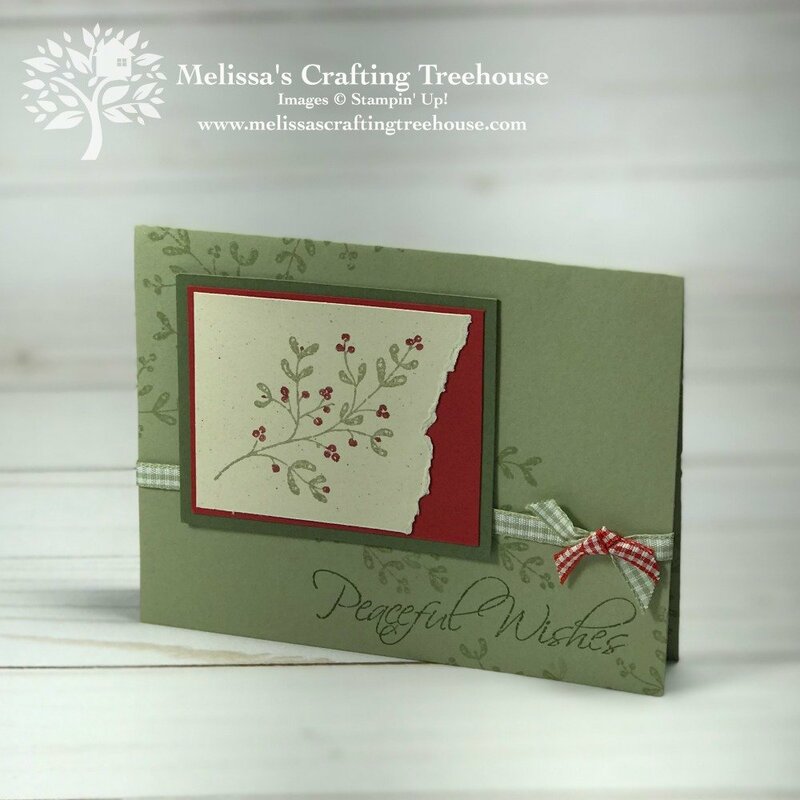 My original card is a Christmas card that I made when I first started as a demonstrator. For my original design, I’ve used a technique called Omitting Markers for the focal piece. 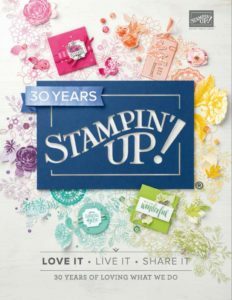 You essentially use Stampin’ Write Markers to color directly onto the rubber stamp applying the colors where you want them. I’ve taken this original design and adjusted it to fit the images I chose in a variety of ways, to make it into a very different card but essentially the same layout! As you can see, I’ve reoriented the design from a landscape to a portrait orientation. The focal piece is also much bigger and the color scheme is completely different. 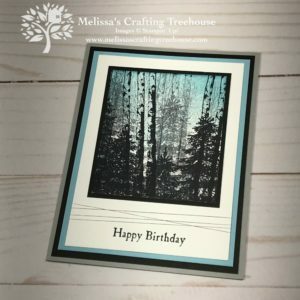 I’ve also used different techniques to create this card! 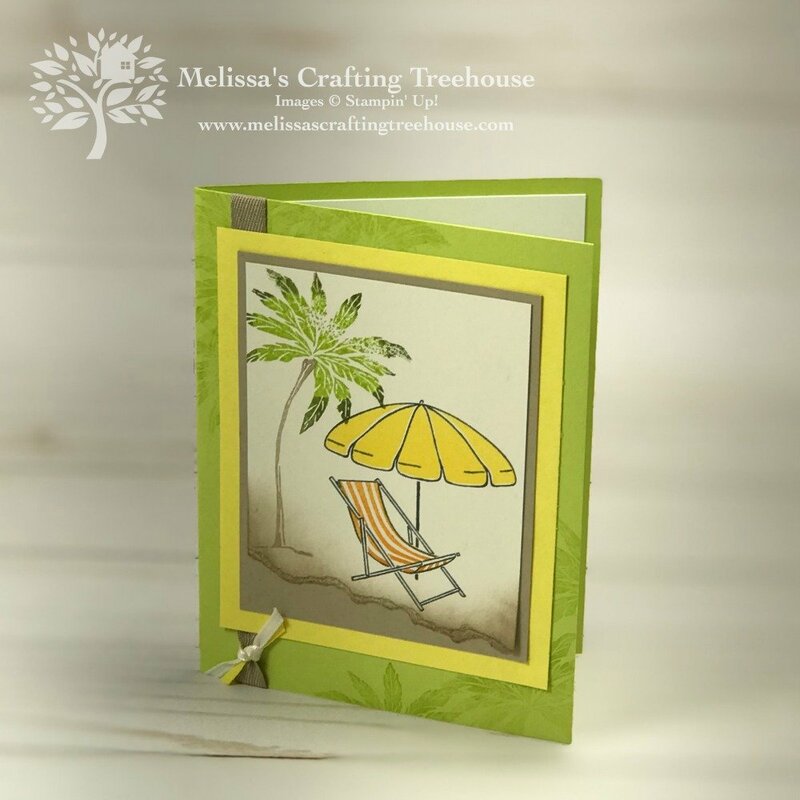 The Beach Happy Stamp Set is designed to be a two step stamping set with lots of images that work together. 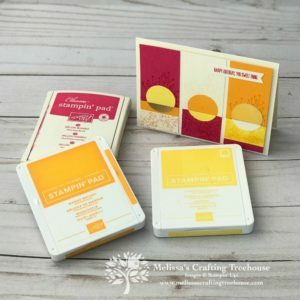 Two step stamping is simply when you use two (or more) different stamps to create your final image. The images can overlay one over the other OR the images may be stamped side by side to make the whole image. 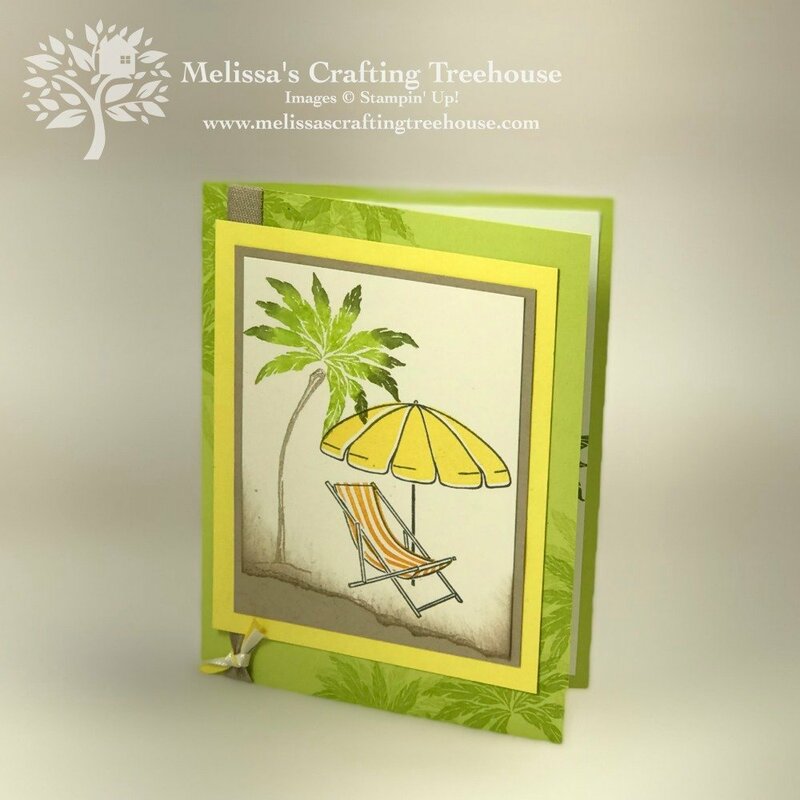 The beach chair and umbrella is stamped with three different stamps, one for the outline, one for the Pineapple Punch umbrella inside and lastly one for the Mango Melody beach chair inside. 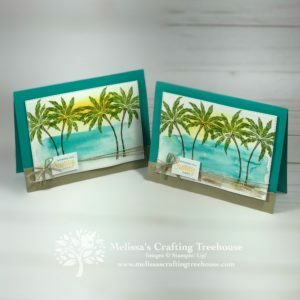 The palm tree is made using two different stamps, one for the trunk and the other for the palm fronds at the top. The Rock n’ Roll technique was used to create the palm fronds. 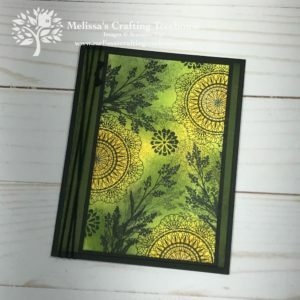 For this technique you essentially ink up your stamp with a light color and then using a second darker color, touch one edge of the stamp on the dark ink pad and then roll the stamp along this darker color to catch it on all the edges. You’re sort of “rocking and rolling” your stamp on the darker ink pad, this the name. Quick Tip: When doing the Rock n’ Roll technique I like to spray my image with a little bit of water to help the two colors blend better. As you may be able to see, on the palm fronds here there’s still a bit of a line on some of the fronds, which means I could have sprayed a bit more water to help the colors blend more. 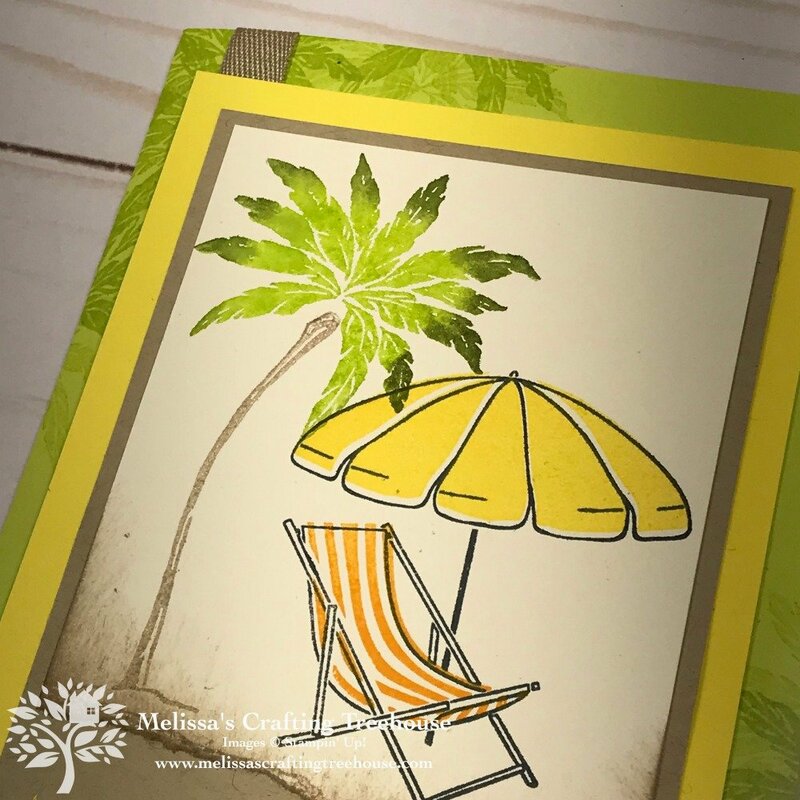 For this first version of my card, I’ve stamped the palm fronds in Lemon Lime Twist, with second inking, in the upper left and lower right corners for some added texture and dimension in the background. For the second version of my card, there are some slight variations. Firstly, for the palm fronds on the card base I stamped these with both first and second inking. This makes those background images stand out more changing the look of the card just a bit. Another difference between this version and the first one is on the palm fronds. If you compare this version to the first one you may notice that the colors blend much more here. That’s because I got more water spritzed on the stamp when doing the rock n’ roll technique. This looks so much more natural to me! What do you think? You may also be able to see that my palm fronds are a little too far above the trunk. 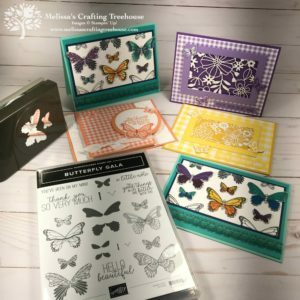 One of the challenges with two step stamping is getting the images lined up with one another properly. 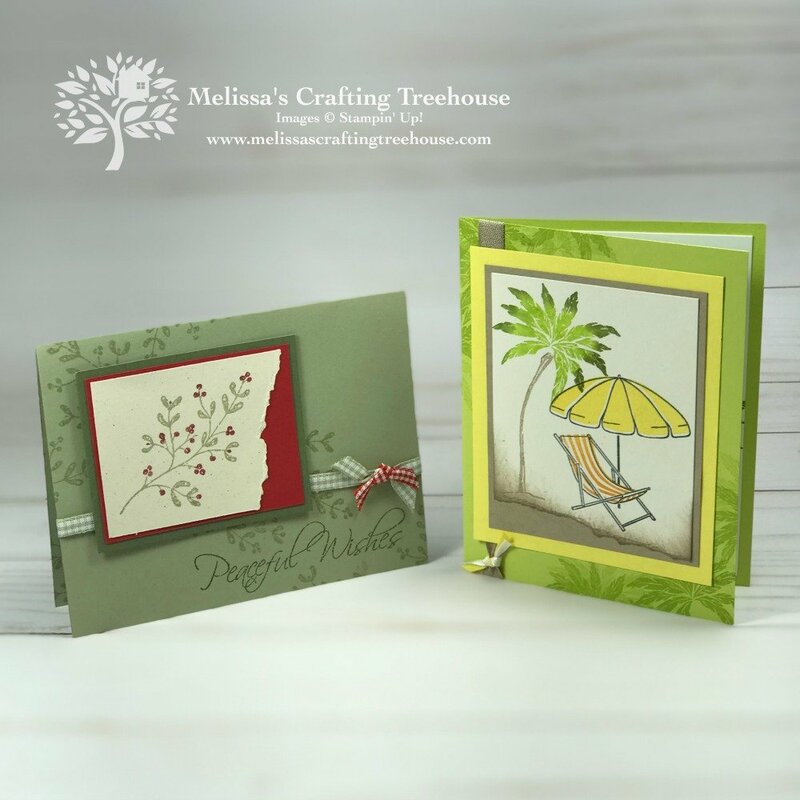 For this card I stamped the trunk first but I could have also stamped the fronds first. It might have been easier to get them closer if I’d done it this way. 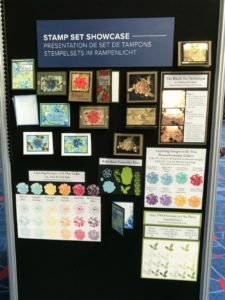 Bottom line, if you practice and play when doing two stamp stamping, you’ll figure out the way that works best for you to get the images lined up. Plus, if you’re making multiples, I recommend using the Stamparatus, stamp positioning tool. That way, you line up your images once, and then your images will be exactly where you want them every time after that. I hope you’ve enjoyed my summery card featuring two step stamping and the rock n’ roll technique. Consider making your own Rewind/Redo project! It’s a super easy, fun way to design! There’s a complete supply list at the end of this post in case you’d like to purchase any of these products. You’ll also find project dimensions ahead! The project demonstration begins at around 20 minutes. Get $175 in product for just $99 when you buy the Starter Kit during Sale-A-Bration! 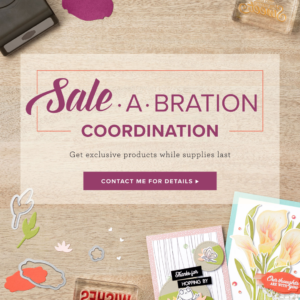 Sale-A-Bration Coordination Products Available Only While Supplies Last! Click HERE to see these products that are still available. 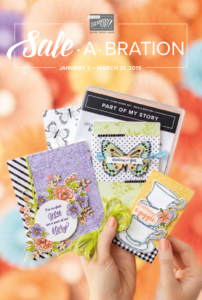 Check out all the FREE Sale-A-Bration Items by Clicking HERE! 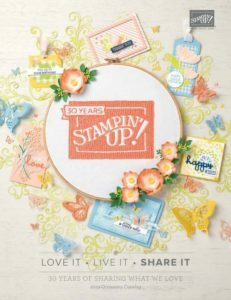 GET a FREE item from Stampin’ Up! for EVERY $50 in merchandise spent during Sale-a-Bration. Click HERE for more details. Join me for my next Facebook Live Event on Thursday 3/28/19 at 7 pm EST – YES! THE TIME of this EVENT HAS CHANGED!!! Become a Newsletter Subscriber and get Special Perks plus FREE Downloads too! Click HERE to subscribe! 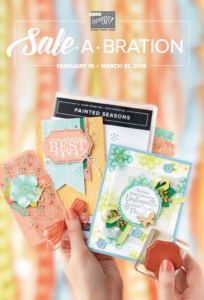 Click Below to see the Sale-A-Bration Coordination Flyer – Products Available to purchase in March 2019! See the 2019 2nd Release Sale-A-Bration Brochure PDF by clicking below. See the 2019 Sale-A-Bration Brochure PDF by clicking below. The dimensions below are for the “Redo” project.